Join your best pal Douguie for a day at the ballpark. Click here to play! If you can help Dougie get to all of the games before the night is over, you could be taking home a pretty hefty paycheck! Every sports lover knows that you have to salute the flag before every game, so keep an eye out for the American Flag as you make your way to all the games. It acts as a wild and will substitute for all other symbols, excluding scatters and bonuses, to help you create even more winning combinations. The first stop is the baseball park! Keep an eye out for the bat and ball symbol. If you can spin two to five of them across an active pay line you'll get up to 10000 times your bet. Football is next on the list. Two to five football symbols will get you up to 500 times your bet. Don't forget basketball! Two to five of these symbols will get you 200 times your bet. Of course, no game would be complete without a little snack. Burgers, pizza, hotdogs, popcorn and soda will also payout so don't shy away from the food! The bald eagle acts as a scatter. Spot this majestic bird soaring over the stadium and you'll get some free spins. 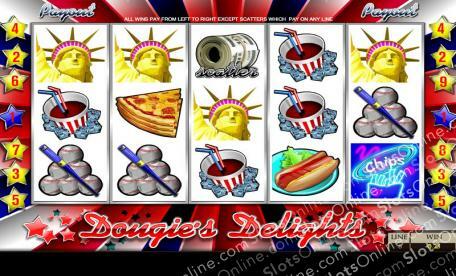 You'll also have the chance at a bonus if you can spin the Statue of Liberty on selected reels. Join Dougie for a night of some real American sports and you could return home with a pretty nice reward! The Bald Eagle acts as a scatter. Spin this rare bird on reels 1 and 5 at the same time and you'll be rewarded with 5 free spins. The American Flag acts as a wild symbol. It will replace all other symbols, excluding scatters and bonuses, to help you create more winning combinations. The Statue of Liberty acts as a bonus symbol in this game. If you can spin Lady Liberty across reels 2, 3 and 4 at the same time, you'll trigger a bonus feature that will award you with a number of coins.